“The Coffee Song” is a novelty song that Frank Sinatra recorded in an uptempo, swing style. The song lampoons Brazil’s coffee surplus. Its theme is summarized in the line, “They’ve got an awful lot of coffee in Brazil” — billions of beans and zillions of tons of coffee. According to “The Coffee Song,” no beverages other than coffee are available in Brazil — no soda, no tea, no tomato juice. Coffee consumption is mandated by law: a politician’s daughter was even fined for drinking water. In order to meet Brazil’s coffee quota, the song says that Brazilians have found novel ways to use coffee: coffee ketchup, coffee pickles, and coffee perfume, for example. There is so much coffee that “they put coffee in the coffee in Brazil”! Bob Hilliard wrote the lyrics for “The Coffee Song” and Richard Miles wrote the music. Hilliard wrote the lyrics for many hits and was posthumously inducted into the Songwriters Hall of Fame in 1983. Frank Sinatra first recorded “The Coffee Song” in 1946. It was a popular hit, rising to No. 6 on the Billboard charts. Americans could relate to the parody of the song. They themselves drank a lot of coffee in the 1940s, and almost all of it came from Brazil. Coffee rationing during World War II had been very unpopular, and price controls during the war had led to well-publicized Brazilian coffee surpluses. 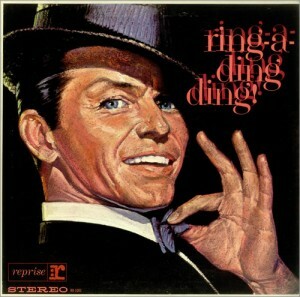 Sinatra re-recorded “The Coffee Song” in 1961 for his first album on the Reprise label, Ring-a-Ding Ding! which reached No. 4 on the U.S. Billboard album charts and No. 8 in the UK. Other popular artists who recorded the song include The Andrews Sisters, Sam Cooke, and Rosemary Clooney. Coffee Crossroads has an affiliate relationship with Amazon.com and other merchants whose products or services are featured on this website. The publisher receives a small fee or commission for sales generated via links from the site. The fee or commission does not increase the price of the sale. For more information, see the Disclosures page. Thank you for supporting Coffee Crossroads!